The deadline to comply with FinCEN’s CDD Final Rule is rapidly approaching, yet many institutions are struggling to decipher the rule’s requirements – and formulate strategies for meeting them. This fast-paced yet authoritative webinar offers expert insight into the relevant issues surrounding this game-changing rule, while offering practical action plans for the AML professionals who must implement it. 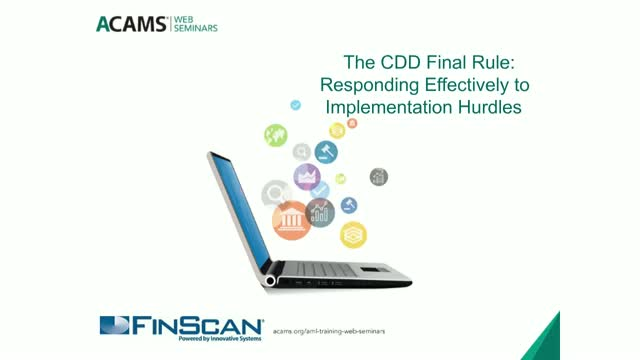 The webinar will also offer a preview of ACAMS Special Forum, “Mastering the CDD Final Rule – A Roadmap to Successful Implementation,” to be held June 19 in Washington, DC. An engaging panel of industry leaders will provide their insights into the role of new technologies to fight financial crime. The experts will highlight the need to separate reality from the hype by discussing the benefits of artificial intelligence and machine learning through the lens of real-life cases. ·Understand the challenges and limitations of conventional technology in an increasing complex financial crime landscape. ·Review of real-life cases where technology played a critical role to enhance detection, strengthen investigations, and improve reporting to law enforcement. ·Gain insights from industry leaders on the future of crime-fighting technology including artificial intelligence and machine learning. Pour ce premier webinar en Français, nous passerons en revue les derniers développements réglementaires relatifs à la lutte contre le blanchiment d’argent et le financement du terrorisme en France (LCB/FT). Après la transposition de la directive européenne 2015/849 via l’ordonnance n°2016-1635 et la loi n°2016-1691 du 9 décembre 2016 (dite Loi Sapin II), la France a considérablement renforcé son dispositif législatif pour lutter contre la criminalité financière. De récents décrets d’application viennent préciser ces dispositifs. L’objectif de ce webinar est de vous donner les derniers éléments de veille réglementaire et les premiers retours opérationnels selon nos experts. Join us for this popular review of the important issues anti-financial crime, sanctions and anti-terror finance compliance professionals faced during the first half of 2018 and a look ahead at what should preoccupy their efforts in the latter half of the year. In the ever-changing landscape of anti-money laundering (AML) risk management, the key to success is aligning today's activities with a future strategy. Join us to explore AML trends and learn how you can prepare now to stay ahead of what's to come. FinTech and RegTech sectors throughout the APAC region are providing financial institutions with new and improved banking, payment and financing options. As a result, financial institutions have made technological innovation a priority with an eye to improving and expanding their product and service offerings without compromising compliance efforts. Our panel of experts will examine FinTech and RegTech developments throughout the APAC region, as well as practical approaches to undertake effective customer due diligence around FinTech products using emerging technology. According to Anti-Money Laundering (AML) and Anti-Corruption regulations, financial institutions must take reasonable measures to determine whether an individual is a Politically Exposed Person (PEP). By placing PEPs into a higher risk model for Enhanced Due Diligence, organizations can protect themselves from being used by money launderers and other harmful activities. But not all PEPs present the same level of risk, it will vary depending on the country of jurisdiction, industry or sector etc. The right combination of management structure with leading edge technology can streamline your global watch list management, reducing noise in your screening process. Managing any global data process can be challenging – managing the variety of lists employed in your screening process is no exception. Whether you’re a large multi-national with lists spanning numerous countries or a financial institution (FI) trying to organize a set of lists in one region—the complexities of watch list management can add significant costs and inefficiency that overwhelm your staff and systems. Many financial institutions struggle with ad hoc management of a decentralized process. For example, local branches have relationships with local vendors and often create local lists, leading to substantial variability and duplication across the enterprise. This duplication creates regulatory risk as there is no clear view of what is being screened across the organization to show to auditors. Beyond the regulatory risk, the data inconsistencies can be a root cause of false positives due to imprecise matching. Join the experts at Pitney Bowes to learn about best practices and innovative approaches to watch list management that will help standardize program management and improve overall data quality to drive better outcomes of your Sanctions Screening and Watch List Filtering processes. Keeping up with regulatory changes as well as the ever-growing sophistication of money launderers and funders of terrorism is critical for financial institutions everywhere, no less in the Middle East and North Africa region. This webinar previews changes arising out of recent developments in the region with an emphasis on presenting concrete strategies for retooling existing compliance infrastructure and beefing up current compliance functions that are required to meet evolving regulatory expectations. The financial crime ecosystem continues to evolve at record pace, and while new technologies and new channels increase opportunities for engagement, they also bring new opportunities for crime. At the same time, customer expectations for real-time, Omni-channel engagement continue to rise. Financial institutions have to improve their approach, not only to protect themselves from risk, but also to provide their customers with fast, safe and reliable services that fit with the pace of their lives. We will discuss challenges and trends in the market, strategic considerations for managing these challenges, and how key technologies and best practices can be combine to improve your approach to mitigation. Is 24 hours too long for customers to wait? Are lengthy Know Your Customer (KYC) & Sanctions remediation processes having a negative effect on the customer experience? What are the causes of inefficient remediation processes? Is financial crime exposure being increased by the poor remediation of alerts? This webinar delivers the views of over 150 financial services professionals as conveyed in KYC & Sanctions Remediation: The Cost of Inefficiency. Find out the challenges your peers face when conducting Know Your Customer (KYC) and Sanctions remediation, and discover potential opportunities to improve outcomes. Curious about earning the CAMS designation? Not sure where to start? Confused about the certification process? This webinar was made especially for you! We understand that you may have many questions about becoming CAMS certified and we are here to answer them. This webinar will provide you with an in-depth look at the process becoming CAMS certified and help you navigate your way to success. Through interpreting enforcement actions to understand the requirements of regulatory and international standards, re-examining the organization’s anti-money-laundering framework, and identifying risks. In this webinar, experts will demonstrate how to test the current program and identify risks with recent enforcement actions, in order to maintain and revise anti-money-laundering related policies, procedures, and controls. Identifying and addressing financial crimes, including those associated with human trafficking, narcotics, terrorist financing and fraud, requires collaboration. Successful public-private partnerships enhance investigation outcomes by allowing both sectors to share the latest trends in financial crime. This webinar will look at joint investigations and offer insights on how banks can provide assistance to law enforcement in the fight against financial crime. Our panelists will also provide strategies for conducting a joint post-investigation review to determine best practices for future collaborative efforts. This June, the FinCEN Suspicious Activity Report (SAR) filing format, which is available on the BSA E-Filing System, will be updated in order to adhere to the changes defined in the Federal Register notice posted in February 2017. During this webinar, notable changes regarding the new SAR requirements will be discussed such as the requirement for batch submissions to be made in an XML-based file, rather than the current ASCII fixed-length delimited file format. Latinoamérica se está convirtiendo rápidamente en centro de interés para el surgimiento de negocios innovadores tales como las empresas que utilizan tecnología financiera, más comúnmente conocidas como empresas FinTech. Este hecho implica que ya no se trata solamente de realizar la Debida Diligencia del Cliente (DDC), sino que también es necesario entender y evaluar el perfil de riesgo asociado al mismo. Asista a este seminario por internet donde profesionales y expertos compartirán las mejores prácticas para aplicar una DDC efectiva en el emergente mundo de las empresas FinTech. Determining identity is a fundamental aspect of risk management for transactions. Increasingly, law enforcement agencies, banks and other organizations must consider the many facets of the identity puzzle in order to combat risk. Moreover, the increasing digitalization of governmental, economic and individual domains has complicated the management and verification of identities. Join Bob Schukai, Global Head of Design for Digital Identity Solutions at Thomson Reuters, for a conversation surrounding digital identity. As your business grows, so too do the complexities of managing AML compliance and customer risk. Disparate lines of business, fragmented data sets, customers in numerous geographies, insufficient scalability of current systems and the need for real-time integration are a few examples of challenges facing today’s compliance programs. During this webinar, we will identify the four major hurdles compliance professionals must overcome in order to achieve a holistic, customer-centric approach to AML compliance. ACAMS chapter members from across Europe will discuss AML regulatory developments in their jurisdictions during 2017 and what can be expected in 2018. According to Anti-Money Laundering (AML) and Anti-Corruption regulations, financial institutions must take reasonable measures to determine whether an individual is a Politically Exposed Person (PEP). By placing PEPs into a higher risk model for Enhanced Due Diligence, organizations can protect themselves from being used by money launderers and other harmful activities. At the same time, not all PEPs present the same level of risk. This will vary depending on numerous factors (including the PEP's country of jurisdiction, industry or sector). Due to characteristics including high value, portable, virtually untraceable and odourless commodities, precious metals and stones are often exposed to elevated levels of money laundering risks. Money launderers and terrorist financers are drawn to precious metals and stones—especially diamonds since they are often highly valuable relative to their weight and also have a relatively stable price. During this informative webinar, our experts will explore initiatives undertaken by an organisation involved with one of the largest diamond dealer communities in Europe to raise awareness and bolster measures that can be taken to prevent the misuse of these products. ACAMS web seminars provide a convenient method to meet training requirements and stay on top of AML trends, sanctions updates and regulatory changes, plus ask questions of industry experts.